Hollywood is coming to Lynchburg this summer as the faith-based film Finding Faith is set to begin filming locally thanks to a strong show of support from Liberty University and Thomas Road Baptist Church (TRBC). At a news conference at TRBC on Wednesday, Sheriff Mike Brown of the Bedford County Sheriff’s Department explained the film’s purpose is to educate families on the dangers of Internet predators. 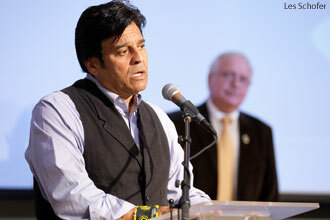 Television actor Erik Estrada will star in the film. Brown, among many other notable accomplishments in his 42 years of law enforcement, has headed one of the nation’s first selected divisions for the Internet Against Crimes Task Forces. The film, which is backed by Safe Surfin’ Foundation , is based on many actual events Brown witnessed in his years as a national leader on protecting children on the Internet. Because the film is interwoven with a Christian message targeted toward teens, Brown asked Liberty and TRBC to be involved with the film and for TRBC to be its host church. The film will utilize Liberty, TRBC and LCA’s facilities for various scenes. Falwell said TRBC will also be involved in promotion for the film and will help them develop resources and study guides for churches, schools and parents. “Chancellor Jerry Falwell, Jr. has basically put his whole university at our disposal,” Brown said. Brown also coordinated with Liberty’s Department of Theatre Arts to have an open casting call at Liberty. The auditions have been open to the public and, according to Brown, at least 30 students from the theatre department have tried out. Liberty professor of psychology Dr. Janet Brown, wife of Sheriff Mike Brown, will be providing insight and assistance to cast members, using her expertise and research on Internet crimes against children. The film is garnering much support, not just from Liberty, but also from politicians and the entertainment industry. Sen. Steve Newman (R-Va.) and Delegate Scott Garrett spoke at the news conference, expressing the commonwealth’s support for the film and their hopes that the film’s message will reach a large audience. Erik Estrada, an actor and activist best known for his role on the 1970s and ’80s television series CHiPS, will star in the film. Estrada is the national spokesman for Safe Surfin’ Foundation. “Liberty has been very generous to us, the facilities are great here, everything is super professional,” Estrada said.